Gel-Pedic pet beds offer the ultimate in comfort, along with the needed temperature balance to keep your pet cozy. Your cat naturally likes to be cradled or to sleep in a curled up position and is sure to love our Gel-Pedic pet bed with its patented contour, that provides a natural pre-nested shape for comfort and security. Since cats sleep about 16 hours a day, why not make this bed your cat's favorite sleeping spot, anywhere in the house. The properties of the Gel-Pedic pet bed work in accordance to the laws of thermal equilibrium. When two objects are in thermal equilibrium they have reached the same temperature During the process of reaching thermal equilibrium, heat is transferred between the two objects. It is understood that the denser an object is, the faster the heat transfers through it. 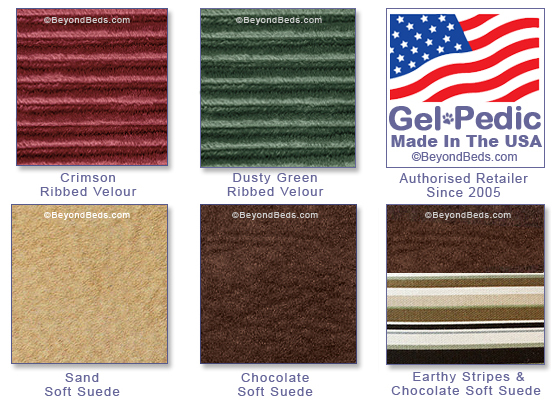 The natural properties of the Gel-Pedic bed are made from polyurethane GelFoam which is one of the most dense bedding materials on the market. Naturally a cat's internal body temperature should be between 100 and 102F. If your cat's body is cold during the winter and the exterior temperature is dramatically cooler, the Gel-Pedic bed does an efficient job of insulating the pet because the cold travels slowly through the dead air space in the GelFoam cells making the bed warm. The reverse is true for the summer. When your cat's body temperature is dramatically warmer than the bed's skin (which is at room temperature), the GelFoam will naturally pull heat from your cat much faster than with standard bedding materials giving a cooling effect to your cat. 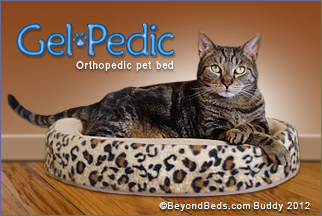 This makes the Gel-Pedic bed a more efficient product than the standard poly-fill cat beds that are less dense. The Gel-Pedic pet bed is designed to give your pet maximum comfort while resting. GelFoam molds and shapes to the contour of your cat's hips and joints providing superior comfort for aging, ailing and arthritic suffering cats. The Gel-Pedic orthopedic pet bed, with it's patented, high quality gel foam material that molds to your pet's body, and the natural nesting shape for your pet's security and comfort, sets it apart from all other pet beds on the market. Washable Cover: Remove cover and machine wash in cold water on delicate cycle while zipped. Lay flat to dry. Do not wash GelFoam. Toy 17" x 13" 14" x 10"
X-Small 20" x 15" 17" x 12"
Small 24" x 19" 21" x 16"
Note: Some cats are sensitive to strong smells and may not take to the eucalyptus bar insert. For this reason when Gel Pedic pet beds, are sold as a cat bed, as opposed to a dog bed ( as they are on this page) beds will ship without the repel a flea, eucalyptus bar insert. Note: It is very important to measure your pet's length before ordering your Gel Pedic pet bed. Click Here to purchase replacement cover.